“Interest rates are at an all-time low. You need to refinance –yesterday!” say the Financial Experts. My husband and I decide to contact a Mortgage Refinance Dude (MRD). Well, ok, I left voicemail. Two weeks later MRD contacted me. “You need to jump on this now!” Ok, where do we sign? He emails us paperwork. Sign this, initial that. Make copies of every page of your tax return. Deliver the paperwork to his office. MRD then informs us that we will need to have an Estimator come look at the property. Yikes! Two trips to Lowe’s and $60 later, the front yard is full of living flowers. Curb appeal. Check. Moving on to the inside of the house…. I am the world’s worst housekeeper, and the proud recipient of the Pack Rat of the Year Award. My teenage son moved out of his room to attend college last weekend. I had to buy paint for two walls, which doesn’t exactly match, but it’s close enough, if you look at it in the right light. Another $40 at Lowe’s for paint, plastic, painter’s tape. It’s good enough. Check. On to the Master Bedroom: One wall is has chipped paint, and stains where someone threw, er, spilled, coffee. There are scrapes from last year’s boots. Back to Lowe’s for another gallon of close-enough-to-the-real-color paint. More tape, more plastic, just charge it; we don’t have any more cash. Come home. Tape the woodwork. Put plastic on the rug. Paint wall. When it dries, I see every mistake. Well it’s close enough, if you look at it in the right light. Check. There’s the matter of cleaning the main bathroom, but first we need to re-paint it. The towel rack “fell” down, leaving holes in the wall, and there was that mold problem. I re-spackle, sand and paint. Now the woodwork is covered in dust and paint chips, and needs to be cleaned. Don’t forget the bathtub and shower. So three days, a few aches and pains later, the bathroom is impeccable. DO NOT USE THE MAIN BATHROOM UNTIL FURTHER NOTICE. Check. Moving into the Family Room, there is dog kibble build-up behind the bookcase and on the floor. I begin scrubbing. My joints are aching, but I push through. It doesn’t look too bad, when suddenly…..
A shriek is heard coming from the back yard. MY DOG JUST GOT SPRAYED BY A SKUNK. Don’t even think about washing him in the main bathroom! The dog endures a tomato sauce bath in the back yard. More shrieks. My dog now has orange fur. 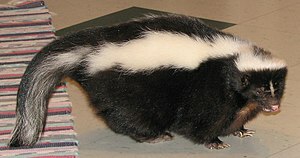 We also had to call “Animal Control” to come get the skunk that was staggering around the backyard like a drunken sailor. Another $150 check — made out to “Cash” — thank you very much. Take another trip to buy air fresheners of every shape and size. Put that on the credit card too. Fans are in every window, blowing air in from the front of the house and out the back of the house. My husband, who has just worked a full 8-hour day, painted the living room, and given the dog a tomato sauce bath, announces he is taking a shower. Twenty minutes later I find him passed out on the bed. My side of the bed is still filled with crap I threw there so I could paint the wall. I decide it’s easier to sleep in the guest room. The guest room! I need to pull everything out of the closet and re-fold; especially those darn fitted sheets, which are rolled up tumbles of cloth. Please, oh, please, let me sleep tonight. No work will be done on Saturday due to a major family event. Sunday we madly scurry about, throwing everything into large Rubbermaid containers and stacking them in the garage…..
Estimator Dude shows up on Monday. He asks, “Should I remove my shoes?” Whew. Good question. The house must look clean. We passed that hurdle. Now I sit next to the phone waiting for MRD to call with our closing date. So refinance now, while the rates are low! I sure hope the refinancing paid for the cost to get the house prepped for the appraisal! Yes, that is usually what happens to us too when we have a plan…..
LOL. It was a nightmare. That skunk was too much.